This Confit of Duck Leg and Goose Foie Gras Ballotine recipe was created by Head Chef Philip Brazil for the upcoming Sheens Falls Lodge Supper Club this September. The dish is served with a raspberry vinaigrette, on toasted brioche buns, and finished with a garnish of micro leaves and fresh raspberries. 1. The Raspberry Vinaigrette can be made in advance and will actually keep refrigerated for up to 2 weeks. Combine the raspberries with the other ingredients and mix in a blender until smooth. Season to taste with salt and pepper before straining through a fine sieve. 1. When preparing the Ballotine, begin by removing the duck meat from the leg and discarding the bone and skin. Then combine the meat with the herbs, garlic and butter. 2. Spread a few layers of cling film on the table and spread the duck meat evenly across. Cover with another layer of cling film and using a rolling pin, roll until smooth and approx. ½ cm thick but even. Put aside in the fridge until the remaining ingredients are ready. 3. To make the Fois Gras, carefully separate the lobes into two half’s and remove the central vein and any large connecting membranes with a very small sharp knife. Try to keep the liver as intact as possible, but taker out any blood spots with tip of your knife. 5. Cook in water bath at 65C for 8/10 minutes, or a Bain Marie for 14/20 minutes if you don’t have a water bath. 6. To assemble the Ballotine, remove the rolled out duck leg from the fridge and remove the top layer of cling film. Spread the cooked baby spinach across the meat, seasoning with salt, pepper and ground nutmeg. Place the cooked goose liver at the lower end of the duck meat and roll until a sausage shape has been made. Once this is rolled there is no further cooking! 7. Make sure the meat is rolled tightly and tie both ends again removing all air bubbles. Leave to chill overnight. 8. Cut 1.5 cm slice of the ballotine, place in the middle of the plate, brush with seasoned olive oil, lightly spoon the raspberry dressing around the plate, garnish the plates with micro herbs and halved raspberries, warm the brioche through the oven and serve on the side. Chef’s tip: allow ballontine to rest for 10 minutes at room temperature before serving. – The Chateau de Navailles from Jurancon in Southwest France is a very nice aperitif and works well with Foie Gras and cheese. It is silky and well-balanced with notes of dried apricot, figs. 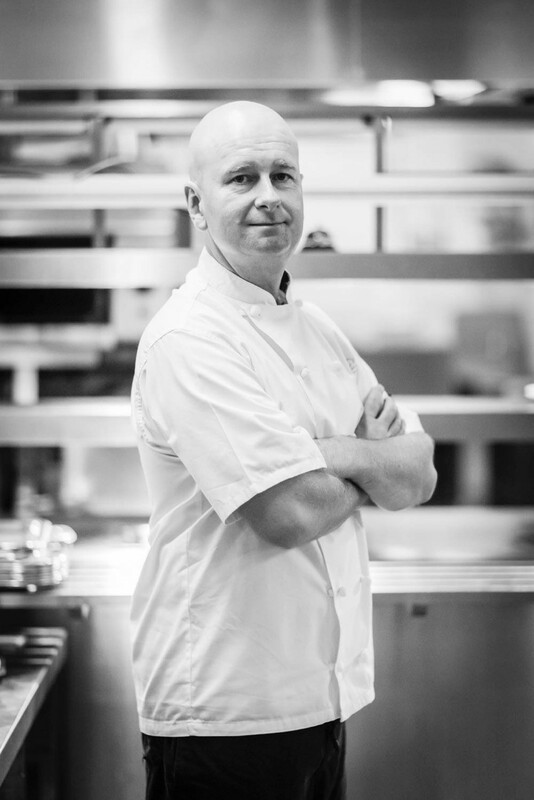 Originally joining Sheen Falls Lodge as a Sous chef in 1999, Philip has since sharpened his culinary skills across the world – and under some of the UK’s best Michelin-starred chefs – before returning full circle to the hotel as Head Chef in May 2013. Born and raised Dublin, Philip developed his love of fresh seafood at a tender age. Alongside his mother, purchasing the morning’s catch at the North Co. Dublin pier of Howth, he loved nothing more than preparing his family’s prawn cocktail, weekly chowder and Saturday’s fish and chip lunch. Philip immediately knew he’d found his calling and began his formal training at the Dublin Institute of Technology. From here, he rose to Sous Chef at Tinakilly House, Co. Kildare, and then to the prestigious role of Sous under Michael Martin at The Clarence Hotel. A move to the UK further increased his repertoire, spending two years as Pastry Commie in Gidley Park Hotel in Chagford Devon, under one-star Michelin chef, Shaun Hill, and a short spell with two-star Michelin chef, Michael Caines. Returning to his Emerald Isle roots, he is now heading up the highly revered kitchen at Sheen Falls Lodge. Philip’s natural flair, international travels and continued professional development are reflected in his creative menus – fusing together different cuisines and cultures with south west Ireland’s freshest produce. For more information on Sheen Falls Lodge follow them on Twitter and Facebook or visit www.sheenfallslodge.ie.